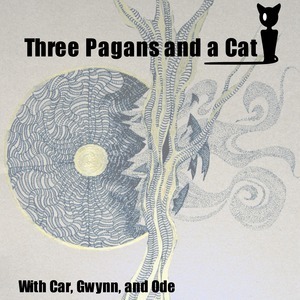 3 Pagans and a Cat - Blog - Gwyn on: Imbolc = Early Spring Cleaning! If you ask, my family will tell you I enjoy holidays. I do. I love the decorations, foods, and activities which mean coming together for some festive fun. For years, the major (Christian) holidays had been a pretty big deal in our house (especially for me) as I prepared meals, decorated and sought to keep the traditions which were passed to me by my mother. As a pagan, my focus on how and what I celebrate has changed quite a bit. In the past as a solitary Witch, I kept solstice and equinox rituals private (even from Ode, who was drawn to the Craft much as I had been, from childhood). Now, however, our entire family is Pagan (four different paths!) so we choose to celebrate the Wheel of the Year as a family. We share traditions and rituals, blending them in such a way that is pleasing (and honoring) to all. Imbolc is two weeks away. Car, Ode and I are sharing a lot of info specific to this holiday in our podcast so I won't go into it all here but the one thing I'm going to touch on is the purification aspect. For me, this is early Spring Cleaning! I love this because where we live it's cold and snowy. The sun doesn't make an appearance very often because of the clouds. Basically, the kind of Winter that makes you want to stay wrapped up in a warm blanket, drink a hot beverage and hibernate. Imbolc encourages me to look ahead. To remember the days filled with sunshine, green grass and flowering trees. To remember that in a few short months I will be able to restore my herb garden as the days become warmer and longer. To sweep away dust (and negative energy), throw out clutter (physical/ spiritual/emotional) and take pleasure in the simple things. These are the things which I focus on during Imbolc. So, if you celebrate Imbolc then consider this aspect of your celebration (if you've not before). If you're new to the idea that cleaning can be part of meaningful ritual then I invite you to try it out in one room. Focus your intention as you clean or go through items that are no longer useful. You may be surprised by the experience and result.